German architectural practice Behnisch Architekten just broke ground on the innovative and energy-efficient AGORA — Cancer Research Center, three years after unveiling the designs. 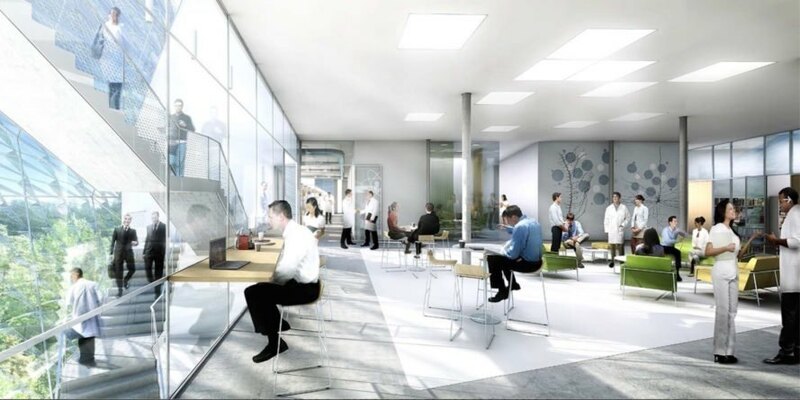 Located in Lausanne, Switzerland, the eco-minded building will bring together 400 researchers and clinicians in a new home for the Swiss Institute for Experimental Cancer Research (ISREC). The green-roofed AGORA building will be wrapped in a specially engineered skin that maximizes natural lighting and ventilation while minimizing heat gain. The sculptural AGORA building will connect to an existing ISREC building on one side and sensitively respond to the surrounding landscape. Transparency is a major theme of the design, from the glazed skin that allows views inside, to the Cancer Research Center’s public level, called the agora. The building’s programmatic areas offer a high level of flexibility so that they can be changed as needed in the future. “Spatial qualities, directly perceived through daylight, proportion and materiality, should be equally visible in public areas and in the highly technical laboratories,” write the architects. “Interdisciplinary communication and disciplinary communication are both central to successful research and are evident in the organization of the floor plans.” In addition to natural daylighting and climate control, the AGORA building will also use renewable and existing energy systems on site for a reduced environmental footprint. The building is slated for completion in 2017. The sculptural AGORA building will connect to an existing ISREC building on one side and sensitively respond to the surrounding landscape. The building’s programmatic areas offer a high level of flexibility so that they can be changed as needed in the future. “Spatial qualities, directly perceived through daylight, proportion and materiality, should be equally visible in public areas and in the highly technical laboratories,” write the architects.